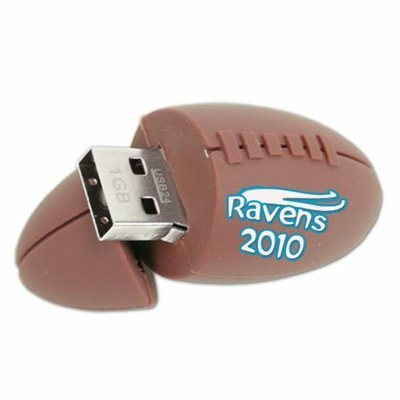 What sports fan wouldn't love a Football flash drive? Made of soft PVC rubber and sporting a nicely sized print space, this is an excellent way to market to the masses! The football-shaped drive's built-in key loop and removable cap make it an ideal promotional USB drive for sports bars, universities, high schools, booster clubs and alumni meetings. Sales numbers will go long with this sports enthusiast friendly promotional USB drive. The soft PVC rubber shape will hold its shape for a long time, and coupled with the data storage capabilities it holds, makes it a great value purchase. Silkscreen printing and a large print space is an excellent combo for businesses looking to brand. The key loop is an added feature that customers will like. When customers like your company gifts, they tend to keep them around and come back for more!